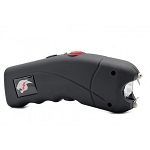 Cheetah Cyclone 2.5 Million Volts Rechargeable Stun Gun (Model CH-23). It is super powerful for its size which measures only 5" long x 2" wide x 1" thick. The rubberized curved and contoured finger grips design fits right in your palm, which gives more control and ease at use. Stun and Light magnet buttons are on opposite sides with master On-Off switch to eliminate misfires. 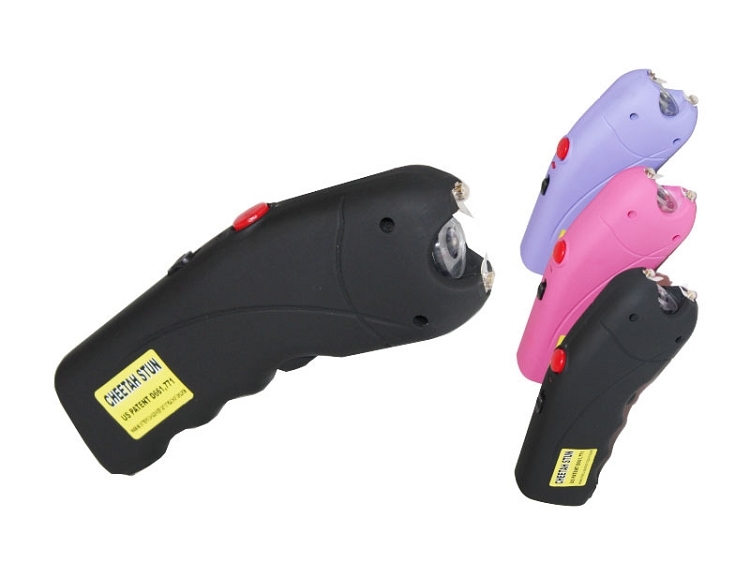 Built in super bright LED flash light. Rechargeable, plugs directly into standard wall outlet (No cord needed). Includes synthetic leather holster with belt loop for easy carrying. Life Time warranty with serial number and gift able box 8.5" x 5.5" x 1.75. Available in Black, Pink or Purple colors. I love my tiny stun gun small enough to fit in my purse, hide in my car, and keep in my pocket when I visit my local Preserve where some minor crimes happened recently. I feel safe.